Ever have one of those nights you just don’t want to be responsible? Well, that was last night for us girls at Awkward Vodka. But that really wasn’t our intention at all. Our plan was to go for a walk – Happy (late) National Walking Day, friends – and then go check out the movie Spring Breakers. Sounds like a nice low-key night, right? We started the evening off with a walk – win! But after that is when things started to downward spiral… We has plans to meet our friend S over at Whole Foods to grab dinner at the salad bar because sometimes we pretend to be healthy. And they have the best salad bar in town, hands down. While waiting for S, we decided to stop over at the Liquor store because… why not? It has been a long week and everyone deserves a glass of wine, especially after an intense walk around the lake. Did you know they made wine juice boxes? They do! 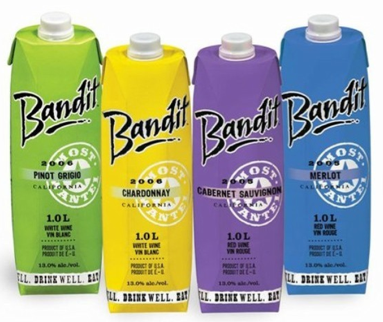 Introducing Bandit wine. Is it amazingly delicious? Mmm not really. It’s ok. But look how convenient? It looks just like that coconut water you can buy in mini boxes, but is way better because it’s alcoholic – duh. And guess what? Whole Foods sells that coconut water – so if we ended up bringing them with us to the store, no one would notice, right? Next think you know, we’re buying three of them and heading over to the salad bar. 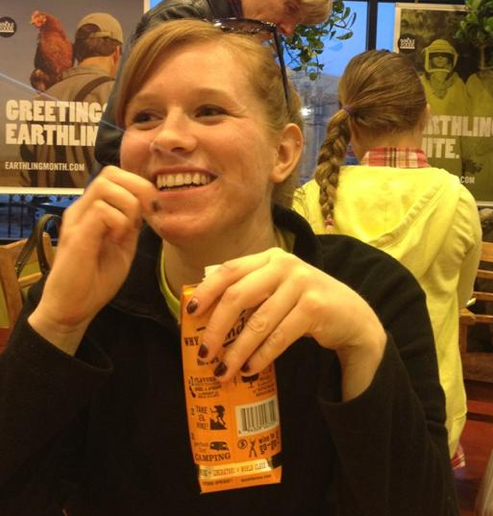 After filling our salad containers to the brim, we sat in the eating area of grocery store surrounded by people, stealthily drinking our juice boxes and eating our yummy salads. 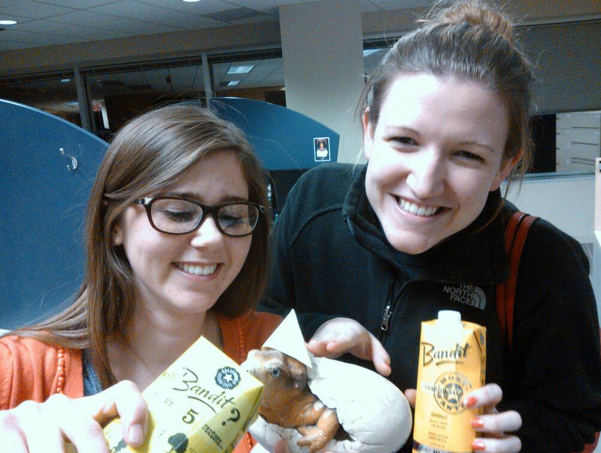 See the awesome photo below documenting our delicious BYOB dinner? And please note the amazing Katniss braid in the background. After slamming our “juice boxes” and salads, S realized she left her wallet at work. Our next planned course of action was to go play darts, so before that we had to stop back at the office pick up her forgotten wallet. While there, we obviously had to leave notes and “really difficult” scavenger hunts for everyone with office supplies – you’re welcome, girls. We hung out for a bit before realizing this is the last place we want to be after work hours so we left…not before stealing some yummy candy from the candy jar and dropping off our spare change in the Monocle Fund of course! The time was creeping closer to our normal 9:00 p.m. bedtime, but by now we were feeling rebellious so instead of darts, we went to check out a new bar in Uptown Minneapolis – Morrissey’s Irish Pub. I’m cautiously optimistic this place could be a new Cowboy Slims (RIP). My only concern is that it doesn’t seem like the type of place to place country music… However, they did have delicious Vodka Diet Cokes – YUM! Buy Bandit wine. It tastes ok, is fairly cheap and can easily hide in your purse. Avoid work after hours. It’s fun for about 5 minutes and then gets sad and boring. If you live in the Minneapolis area, check out Morrissey’s Irish Pub in Uptown on Lake St.
Hope you also had a fabulous Wednesday evening!